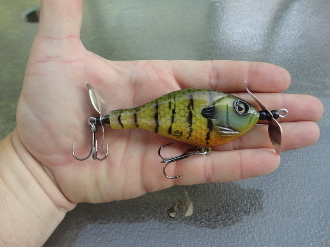 The brand new Buzz Hog Prop bait by Tater Hog Custom lures features a realistic Bluegill profile and Tater Hog paint finish. The bait weight is 3/4 oz and is made from a solid resin material that will not be harmed by water over time and after hook rash. Unlike most other wooden lures this bait will not soak up water after it gets marked up by wear and tear. The bait is 4 inches in length and features stainless steel hardware and hook hangers. The best way to fish this bait is on a medium heavy to heavy rod with braided line. Find the bream or bluegill beds and hold on! Normally look in the back of creeks, cuts or coves for small circle like places in sand or bottom. Best time of year to use this bait is the HOT SUMMER!